For those of us who live in New England, driving by blighted mill buildings and vacant downtowns is an all too common experience. Of course, it wasn’t always that way. During the Industrial Revolution, New England’s abundant rivers and streams powered those once mighty mills which during their heyday led the country and the world in industrial output. Then, beginning in the 1970’s and continuing into the early 21st century, cheap labor and fewer regulations drove New England manufacturers overseas-leaving those quintessential rural mill towns with a lot of open lots, empty buildings, and broken hearts. Well, the sun may once again be rising (literally) for “mill towns”. Solar energy has long been touted as the planets saving grace. After all, as long as the sun keeps shining, solar cells keep pumping out energy. But to capitalize on this virtually inexhaustible power source, there are two critical factors that must be present: large plots of land to allow for sufficient solar panel deployment and three phase power lines to allow the generated solar energy to flow into the electric grid. Although to many those dilapidated mill buildings may appear an embarrassing legacy, it was their mighty power requirements that drove the construction of existing electrical infrastructure crucial for today’s solar arrays. And by design many New England communities have maintained their rural nature-thus satisfying the need for large tracts of land. Combine the two, and you have an attractive environment for very large very productive solar power installations vis-a-vis a Solar Revolution. To give you an example of how the Solar Revolution has already begun, let me share with you the story of my home City of Franklin, NH. Franklin is located in central NH and is very much a mill City. Like others, this once industrial powerhouse was staggered by the closing of its iconic mills and has since struggled to seize upon the next great opportunity. Although eyesores, those mighty mills left a vast electrical infrastructure. That, combined with the city’s rural setting has attracted the attention of a major solar developer-NH Solar Garden. 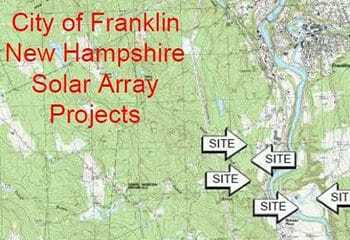 Teaming with Nobis Engineering, a major land development and environmental permitting firm, NH Solar Garden approached Franklin municipal officials to discuss developing solar arrays on large tracts of unproductive city-owned properties all located adjacent to vital electrical infrastructure. As a result of those initial talks, NH Solar Garden is moving forward with nearly 9 megawatts of proposed solar installations. Upon completion this will be the largest single solar installation in the history of the State thus earning Franklin the title “New Hampshire’s Solar Capital”. Throughout its thirty year life expectancy, the solar arrays will generate thousands of megawatt hours of carbon free energy, hundreds of thousands of dollars in lease payments to the City, and residual property tax payments for land that was virtually worthless in its present state. The City of Franklin will also have access to stable predictable power rates with the potential to save tens of thousands of dollars in electricity costs over the life of the arrays. And most importantly, the City will be able to reverse a pervasive perception from one of a struggling 19th century old mill city to one of an advanced modern 21st century environmentally conscious low carbon green energy mecca. I can hear our Mayor now, “Apple, Microsoft, Google, you should relocate some of your operations to a truly sustainable city, Franklin-the Solar Capital of NH!” Now that’s going to raise some eyebrows! Just as water power had propelled Franklin to “powerhouse” status in the 19th and 20th centuries, it may be among the first of many New England “mill towns” to regain its illustrious status by capitalizing upon the Solar Power Revolution.